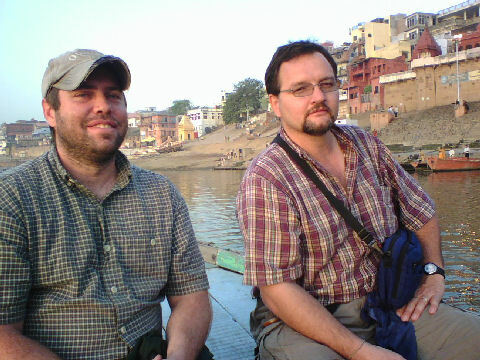 We took two boat rides on the Ganges River here in Varanasi, one in the evening, and one starting at 5:30am. 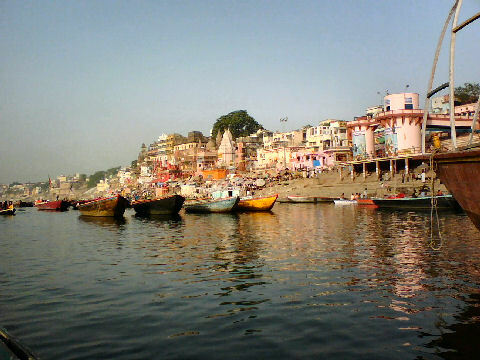 The Ganges is the most holy river for Hindus–they believe it to be a goddess. 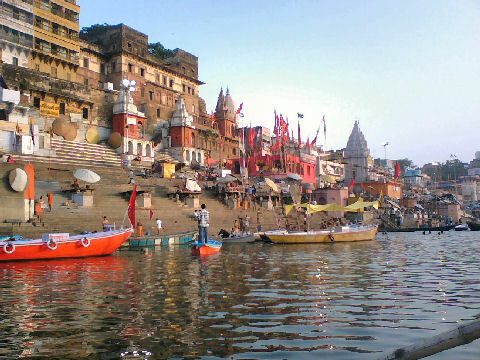 Hindus believe that if a person dies in Varanasi they are freed from the endless cycle of death and reincarnation and achieve paradise. 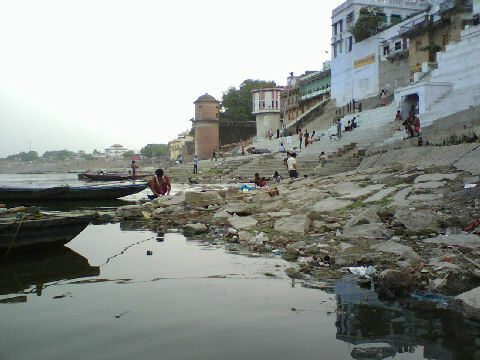 There are two sites along the river where, day after day, the bodies of the dead are burned and their ashes thrown into the river. Last night, 13 bodies were burning at one of these sites when we passed by. 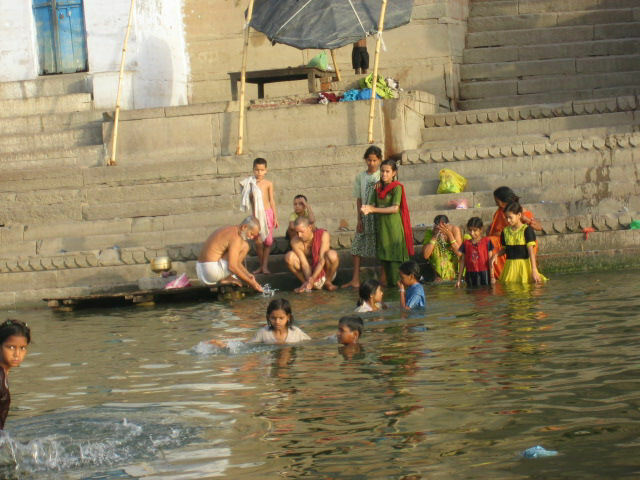 Locals tell us that burning a person and throwing them into the holy river purifies and beautifies them. 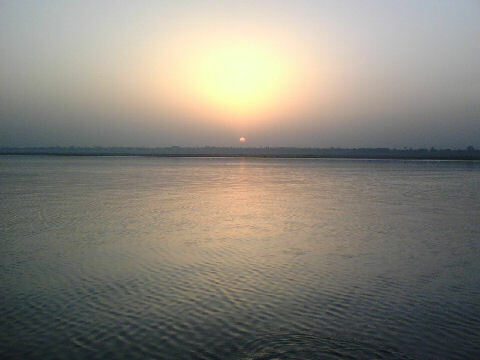 Paradise touches the river, so a person who has been cremated and thrown into the river enters paradise. People who died of a disease such as smallpox or leprosy. People who died of a snakebite. 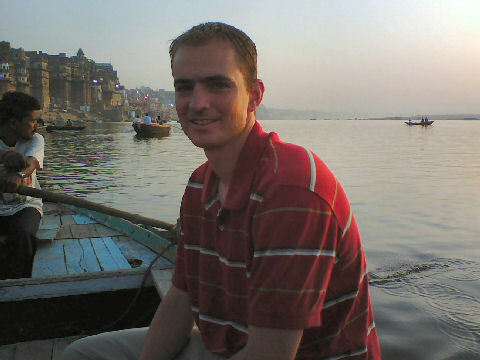 Hindus believe that holy men and young children are without sin, and therefore are not in need of the purification provided by burning their bodies. 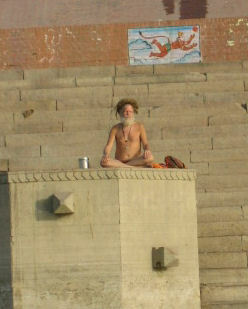 In fact, holy men wear orange robes that represent the cleansing fire they have passed through to become holy men. 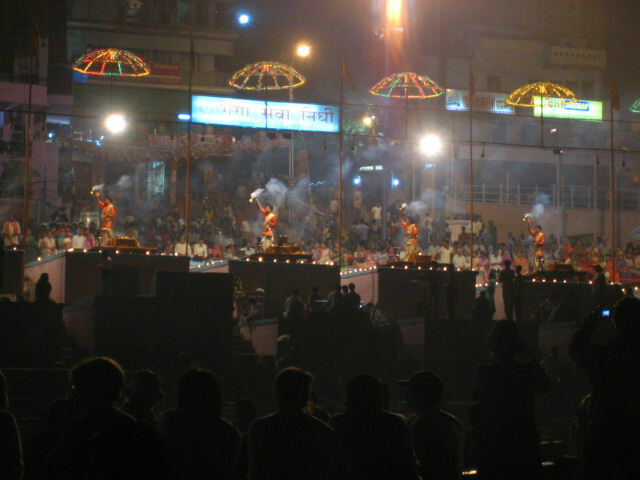 Hindus believe the second two types of people have been cursed by the gods and have bad karma, so it is worthless to try and purify their bodies by burning. 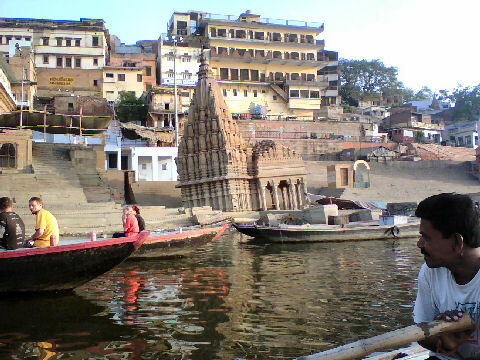 Varanasi has been leveled several times by invaders, most recently around 1750. 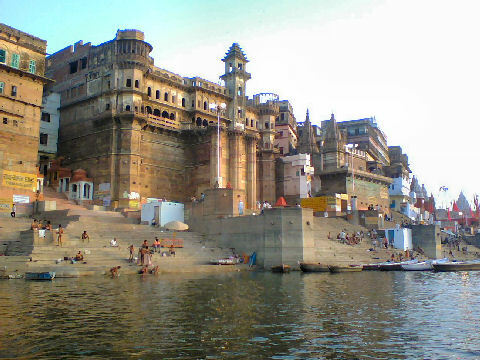 It has many historic and impressive-looking buildings its citizens constructed shortly after the last destruction. 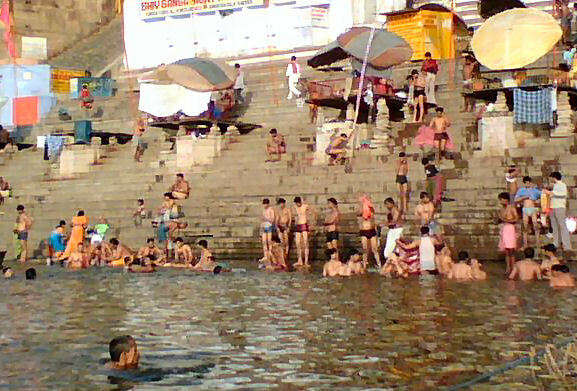 Hindus believe that bathing in the holy river cleanses a person of sin, so every morning, you can see thousands of people washing themselves in the Ganges. 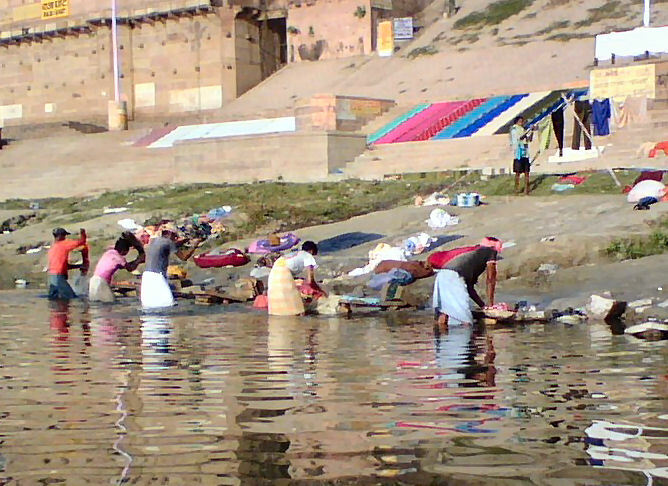 Men washing clothes in the river by soaking them and then slapping them on the rocks. We saw a few women washing clothes, too, but mostly men. I believe the colorful cloths laid out on the stone steps are silk, though I’m not sure. 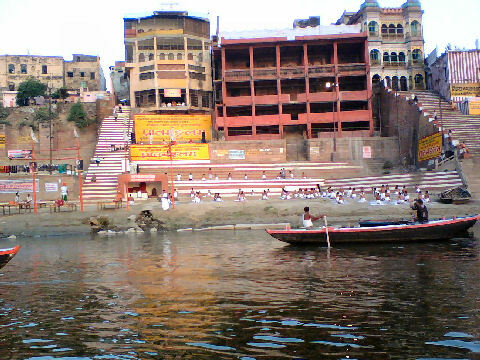 Varanasi is famous for its silk factories, which are primarily owned by Muslims. The owner of our guest house owns a silk factory, as well. Today he allowed us to go see some of his men hand-weaving the silk on a large loom, and then he took us to his store to display the finished products for us. 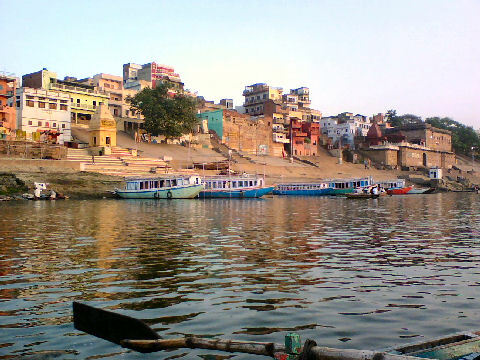 Varanasi silk is multi-colored and very beautiful, and some of it has incredibly intricate designs. To make an ornate piece of silk the size of, say, a tablecloth, takes one man about two weeks of work.